One summer’s day in 1982 I drove from Cavtat to Sarajevo in a new Yugo without a working handbrake; an interesting drive. Von had a migraine and was lucky not to be with me on the ride, though she missed sights that have stayed with me for the rest of my life. The beauty of the Bosnian countryside, for one, sprinkled with exquisite alien mosques, sharing the villages with onion-domed Orthodox churches. The mosques had been there for centuries, but they still looked like strangers in a green land to my eyes, better suited to a desert clime. Seeing them framed in European countryside simply seemed wrong, although they were beautiful to look at, unlike the flashy and trashy modern mosques cheaply thrown up in British city suburbs today. The bridge at Mostar, for another, improbably tall and thin, impossibly beautiful, built by Muslims in the C16 — ‘Mostar’ simply means ‘Old Bridge’ — with boys jostling on the parapet, raising sponsors to pay for their death-defying plunges 70 feet into the Neretva. I waited for 40 minutes but not one jumped. It took over 60 Croat shells to destroy it in 1993. 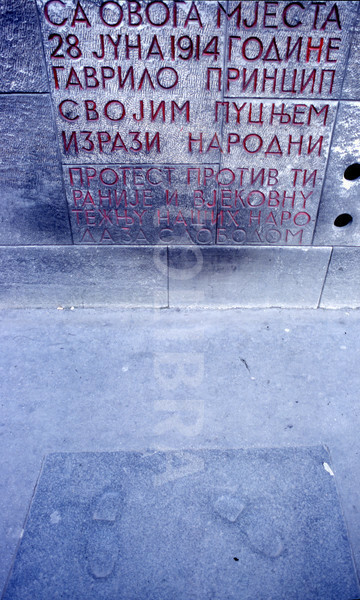 Here on the pavement in a side street in modern, cosmopolitan Sarajevo, shortly to host the Winter Olympics, was a carving of a pair of footprints. This was where the assassin Princip fired the fatal shot that is genarally agreed to have started the First World War — the shot that was heard around the world — which killed the Archduke Franz Ferdinand in his Gräf & Stift Phaeton. The make of the car was as appealing to me as anything else at the time. Curiously I now own a Phaeton, sadly not the Gräf & Stift version. I haven’t seen another picture of this for some time. I don’t know if it was destroyed in the Bosnian war. But I’ve been there, seen that. And pondered on the futility of war. “Maybe I’m out of touch, but I’d rather go to an actual shop — preferably a small one — than to a harshly lit superstore, or, worse still, a website. I don’t want to buy my books and my toilet paper and my clothing all under the same roof. I want beauty in my life. I want charm. I want contact with actual people. It is, for me, a large part of what makes life worth living.” —David Sedaris in an interview with Mary Laura Philpott, editor of the Musing blog at Parnassus Books, Nashville, Tenn. Thanks to Shelf Awareness for pointing this out.